An electric bike kit is a simple and great idea. It allows you to take a bike you already own and convert it into an electric bicycle in a short period of time. You can buy an electric bike conversion kit and install it on your bicycles all by yourself or with a help from your local bicycle shop. The electric bike conversion kit industry have seen a significant growth in the last decade. There are quite a lot of startup-ups and well established companies that sell their conversion kits in the market nowadays. There are a couple of core types of electric bike kits and each type has it's pros and cons. Should you buy a conversion kit or an off-the-shelf electric bike? Build your own electric bicycle from the ground up. Buy an off-the-shelf electric bicycle. Buy an electric bike kit and install it on a bicycle. But how do you know what is best for you? Click here to read further about the pros and cons of each one of the alternatives. Also, here is a short check-list with 15 points that can help you make your choice more clear and organized. The conversion time that is advertised by the manufacture doesn't always reflecting the real conversion time for the average person. You need to be aware that if the manufacture stats that the conversion time take 20 minutes or 2 hours, it will probably take more time. You just probably don't have a workshop and the same expertise as the guys who sell the kits. Therefore, you will maybe find it a little bit harder and a little bit more time consuming then what you've been promised. But in the vast majority of the installations, it's really not such a big deal, because this 20 minutes or 2 hours won't stretch for much longer. Also, the conversion time depends on the electric bike kit type (more about this below), some motor mounting positions require more work then others. Buying a conversion kit usually costs less then purchasing an off-the-shelf e-bike if you already have a bicycle. If you don't own a bicycle and you are thinking about purchasing a bicycle and a conversion kit separately, first compare how much a similar off-the-shelf electric bike would cost. 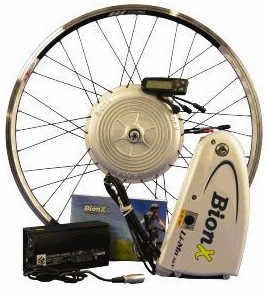 The popular Bionx kit, for example, can be more expensive then buying a complete bicycle with a retrofitted Bionx kit! But it's not just a question of money, if you have a bicycle that you love and you are already accustomed to, an electric bike conversion kit can be a better and more affordable solution. The price of an electric bike kit can be as low as $300 for a kit without batteries and up to even $3000 for a very sophisticated kit with a lightweight, high energy density battery, a powerful motor and regenerative braking. The battery is the most expensive part of the kit. It maybe worth considering buying a kit which doesn't includes a battery and buy your battery from other less expensive source. You need to understand the differences between the low-priced kits and the high-priced kits. There is a huge difference between them. The level of performance and the quality of the different parts is totally different. Steps 2 and 3 in the how-to-choose page can help you understand what should you aim for. Shipping a complete conversion kit can be costly. A complete (with the battery) conversion kit box can weigh easily 10kg. The size of the box is usually as big as the size of the wheel. Shipping a box as heavy and as big as this can be costly so don't forget to check the shipping rate before you make the order. The conversion kit should come with some kind of warranty. Obviously, the warranty is very important and you should aim to get a decent one. Also, you should be aware that by adding a conversion kit to your bicycle, it may void the warranty on the bicycle. A detailed list of conversion kits from different manufactures can be found here. How the installation process is going to look like? There should be an installation guide that instruct you on the different installation steps. Nevertheless, you can play with the location of some of the parts. Each bicycle type has it's own "best place" for the different parts. The instructions that come with the kits can often be unclear (assuming they're even in English or preferably, in your own native language), and using batteries from a different supplier can add to the confusion. The following instructions are only guidelines. The exact installation process of your conversion kit can and probably will be different. If during the installation process, you face some difficulties and if you don't have enough experience with bicycle mechanics, it's highly advisable to get some assistance. It will save you time and frustration.